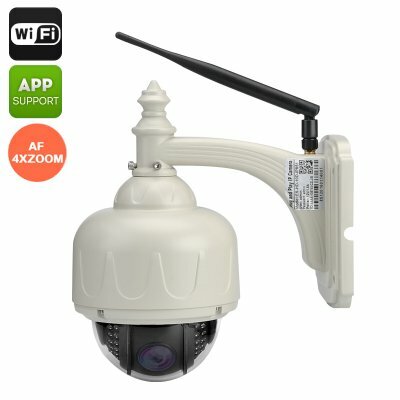 Successfully Added Wireless Waterproof PTZ Camera - 720P, Wi-Fi, Android +iOS Apps, Night Vision, Motion Detection, 4 x Zoom, Two-Way Audio to your Shopping Cart. This Pan-Tilt-Zoom camera comes with a 4 x zoom, 720P video quality, night vision, SD card recording and more. This Pan-Tilt-Zoom camera is equipped with all the necessary features to provide your home with secure monitoring when you are away. The camera comes with 355-degree rotation and a 90-degree tilt, letting you see large areas regardless of where the camera is placed. With a 4 x zoom, no detail will miss the camera’s attentive eyes. It also features Onvif compatibility and will be easy to integrate into your current security system. The camera comes with IP66 waterproof rating and you can easily place it outside to monitor the area around your home or office. Even after the sun sets, you will have a clear view of the outside thanks to the 15-meter night vision. With two-way support audio, you will also be able to hear what’s going on and interact with your visitors if needed — simply hook up an external mc and speaker. Your waterproof PTZ camera also features motion detection. You can choose 4 detection areas in your house or property and be instantly notified should any suspicious activity take place there. It will also make a quick snapshot of the area and send it to you via email or make a recording that will saved onto the SD card. With Android and iOS support, you will be able to take a look at what’s happening in your home on your smartphone — a convenient and easy home security scenario for when you are away. The Wi-Fi PTZ Camera comes with a 12 months warranty, brought to you by the leader in electronic devices as well as wholesale PTZ cameras..